Using an agent-based model, a research method that simulates a diverse range of individual interactions in a computational environment, Hutton researchers explored this subject in greater detail. Their findings suggest informal policies whereby team leaders expect colleagues to experience day-to-day and face-to-face interaction can be even more damaging than where there is no workplace sharing at all. The effect of the workplace sharing programmes also depends on the spatial distribution of existing road network, as well as industrial and residential areas. 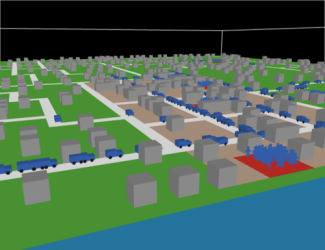 In an earlier study in 2016, an agent-based model was used to explore the combined effect of factors influencing commuting patterns and CO2 emissions in Aberdeen. Again, it was found that unexpected systemic effects emerge from individual interactions. For example, flexi-time not only reduced commute time significantly, but also made the time spent commuting more reliable and reduced CO2 emission from traffic. In comparison, it was discovered that the new bypass would only reduce commuting time by a small amount, while slightly increasing total CO2 emissions. Dr Jiaqi Ge, a social systems simulation modeller at the Institute and co-author of the research, said: “We found that the apparently attractive ‘win-win’ policies of workplace sharing can be negated by unseen factors such as informal working practices. The aggregated systemic effect is highly context sensitive, and nothing like as clear-cut as suggested by the effect on one individual. We can indeed have too much of a good thing! Sometimes, policy solutions that make perfect sense at first sight can lead to unintended consequences because, although people make decisions independently, the effects of those decisions are played out in a shared space. More information regarding the research studies can be found below.